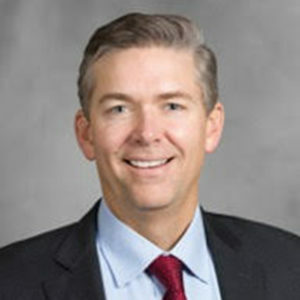 Dr. Parsons is Professor of Urology, Endowed Chair in Clinical Research, and Director of Genitourinary Clinical and Translational Research in the Department of Urology at the Moores UC San Diego Comprehensive Cancer Center. His research focuses on prostate cancer, benign prostatic hyperplasia (BPH), and patient safety. He is a principal investigator for multi-center clinical trials funded by the National Cancer Institute (NCI) and the Department of Defense. He is an author on over 130 peer-reviewed publications, including papers in The New England Journal of Medicine, The Journal of the American Medical Association, and European Urology. He is an Associate Editor for Prostate Cancer Prostatic Diseases and a consulting editor for European Urology. Dr. Parsons is vice-chair of the National Comprehensive Cancer Network (NCCN) Panel on Prostate Cancer Early Detection and chair of the GU Surgery Committee of the NCI Alliance for Clinical Trials in Oncology. He serves on the AUA Clinical Guidelines Panel for BPH and the national Practice Guidelines Panel for the American Society of Clinical Oncology (ASCO). Dr. Parsons’ surgical practice focuses on prostate cancer, bladder cancer, and complex BPH. He has expertise in robotic prostatectomy, MRI-guided prostate biopsy, and MRI-guided focal therapy. He has been peer-elected to the America’s Best Doctors® and the San Diego Medical Society Top Doctors lists for several years. Dr. Parsons is also the award-winning author of the acclaimed novels DOING HARM (St. Martin's Press, 2014) and UNDER THE KNIFE (St. Martin's Press, 2017). For more on Dr. Parsons’ novels, visit http://kellyparsonsbooks.com. 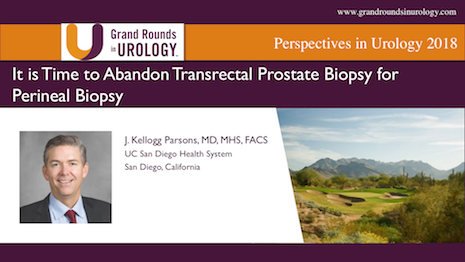 J. Kellogg Parsons, MD, discusses rising concerns of sepsis following transrectal ultrasound (TRUS) prostate biopsy. He then reviews the literature proving a reduction of infection-based complications with transperineal biopsy and argues for the transperineal approach superseding TRUS in clinical practice. J. Kellogg Parsons, MD, discusses the role of the National Comprehensive Cancer Network (NCCN) Prostate Cancer Early Detection guidelines in the PSA screening debate. He then provides commentary on the three algorithms included in the guidelines. J. Kellogg Parsons, MD, reviews general principles of patient safety as applied to urologic practice. He provides practical instructions about handling urologic complications, specifically rhabdomyolysis, venous thromboembolism (VTE), air embolism, laparoscopic bowel injury, and prostate biopsy infections. J. Kellogg Parsons, MD, reviews the 2018 American Urological Association (AUA) Guidelines for benign prostatic hyper-plasia (BPH). He emphasizes the topics excluded from the guidelines, as well as statements on preoperative evaluation, surgical therapies, and medically-complicated patients.